How do you know if an interview went well or not? While you can never be sure how it went until you hear their final decision, there are a few signs that indicate the interview went pretty well. So I’m going to reveal the top 7 ways you can know if an interview went well while you wait to hear feedback. Important note: If you don’t see these signs, it’s not necessarily a sign the interview went poorly, it just means you need to wait to find out. The bottom line is you’re never 100% sure until you hear the news. This is a very strong sign that the interview went well, especially if they ask toward the end of the interview. In fact, any questions about your availability and timing are a very positive sign. For example, they might also ask, “how long of a notice period would you need to give your current employer?” (If you’re interviewing when you have a job). Questions like this in your interview show that the employer is thinking about offering you the job, and thinking about what happens next and when you could start. Or if it’s a first phone call, they might say, “We’d like to have you come in and meet with our team face-to-face.” That’s an obvious way to know a phone interview went well. Now, if they do tell you something like this and then you don’t hear anything for a few days, I’d follow up to get a response. Sometimes HR people (or whoever is handling the scheduling) just forgets or moves very slowly, and a polite follow-up can’t hurt. Sometimes an HR person or recruiter on a phone interview will say it sounds like a great fit and they’re excited about your qualifications. They might say they’re forwarding your details to the hiring manager or recommending that the next person in the process speak with you. This doesn’t guarantee that it’ll happen, but it’s a sign your phone interview went well and you did everything you could to impress them. Now, it just depends on what the hiring manager thinks. (The recruiter will bring some notes to the hiring manager usually and tell them how the conversation went, and what they recommend). In face-to-face interviews with hiring managers, you’re less likely to hear something like this (even if the interview is going great). Why? Employers keep their opinions a bit more hidden at this point, and it’s more difficult to know if the interview went well. This isn’t always a sign the interview went well. They might just be somebody who smiles a ton, and they might just be having a great day when they walk into the interview room. However, it’s still a good indication that you’re doing pretty well in the interview if the hiring manager seems happy and in a good mood. If they’re laughing, joking, or talking about personal topics like your hobbies and interests outside of work, those are great signs too. But don’t worry if none of this happened. Some interviewers are just very work-focused and won’t do this, even if they like you a lot. You really cannot judge based on one signal by itself, so don’t freak out if you had an interview and they kept it 100% serious. One way to know your interview went well is if it went longer than scheduled. If the interviewer loses track of time and/or just chooses to keep talking to you for longer than planned, it means they like your interview answers and are enjoying the conversation. So, those are all good things. There really isn’t a scenario where having the interview go longer than planned is bad. It’s a great sign and a pretty reliable way of knowing that you did well. Now, this isn’t the best way to know if your phone interview went well, especially if they asked very early. 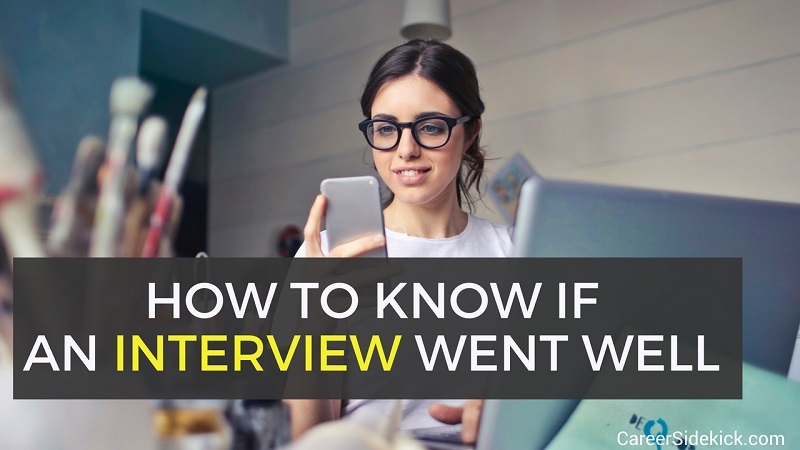 However, if you get questions about your job search, what other companies you’re interviewing with, etc… and it’s not just one of the first few phone interview questions they asked you, it’s definitely a good way to know that your interview went well. They’re trying to figure out how fast they need to make you a job offer to get you on-board. And they’re measuring the competition. They are trying to figure out who else you’re considering, and how to persuade you to come work for them. So it’s a good reason to get excited if you hear questions like this after a few rounds of interviews. You might hear this question in the interview, or in a follow-up call with a recruiter or HR person. Just like #6 above, this isn’t a very meaningful hint that the interview went well if it happens in a first phone call, or very early in an interview. It could just mean they ask everyone this question. But if they ask about your salary expectations toward the end of a face-to-face interview, then it’s a good sign. By the way – if you want help answering this question, it’s one of the questions I go into more detail on in this list of top interview questions and answers. (It’s question #6 on that list). … And that’s when the employer calls you or emails you to share feedback. You could do everything right in the interview and still not get the job. There’s a lot of luck involved in job searching. So counting on one single job offer is dangerous and could set you back weeks if it turns out you get rejected after the interview. So even though it’s tempting to wait and hope for good news, keep applying for positions and setting up interviews. If you follow these steps, you’ll find a new job faster while feeling much less anxious in your job search.